(Note: I entitled this piece as "Tax competition 1" because I intend to write more papers on tax policies, especially on income tax, by other countries). 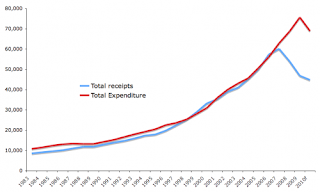 Ireland maybe economically wobbling now because of the huge debt it is facing, and some cut in the welfare system that will be needed to reduce the debt and the budget deficit. But it has long term stability resting on a low income tax policy, which attracts huge businesses, employing tens of thousands of workers and exporting tens of billions of dollars yearly. Ireland's corporate income tax rate is only 12.5 percent, among the lowest in Europe, like Russia's 13 percent, 12 percent by Belarus and Georgia, 10 percent by Albania, Bulgaria, Serbia and Macedonia. Huge European economies like France, Germany and UK, those which have high income tax rates, are envious if not angry, at Ireland's low corporate income tax as it causes "unfair" tax competition with them. To blame Ireland's low income tax policy as among the "main causes" of the crisis is wrong. It was the spend and spend policy of the current administration. 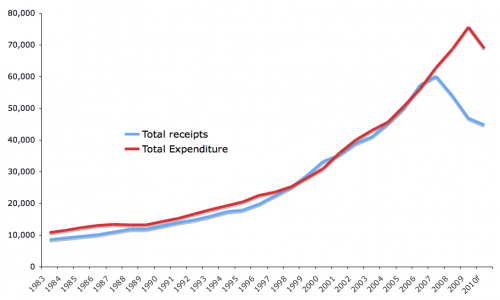 This graph shows why: by 2007, as revenues started falling, expenditures keep rising. That's clear fiscal irresponsibility. Graph source is The Road we Travelled by Dr. Gurdgiev. Ireland’s corporate tax policy has lured many multinationals, from drug companies like Pfizer and Forest Laboratories, to technology titans like Google and, more recently Facebook and LinkedIn. Together, they employ more than a quarter million people in the country, and account for about 70 percent of exports. Pfizer, which has been in Ireland for decades, is among the many multinationals monitoring the tax debate. “When you’re a company like Pfizer, you make billions of dollars of investments for the long term because Ireland has provided certainty” about the tax rate, said Mr. Duffy, the vice president. “When you start to mess with that, you raise issues of trust” that could cause some companies to reconsider the wisdom of investing in Ireland, he said. Right there! Low income taxes are incentives to businesses, which create jobs, which earn huge revenues and exports, which pay various consumption taxes (sales tax or VAT, property tax, and so on). So a low income tax rate does not mean low overall tax revenue. It can be the opposite as more business locators in the economy pay other taxes aside from income tax. Thus, Ireland must keep its low corporate income tax rate. It must resist "suggestions" from EU politicians, especially those from Germany, France and Belgium, to tinker that rate upwards to finance the bail-out money from the EU and the IMF. This is a lesson for all economies in the world, rich and poor alike. You do not penalize work and entrepreneurship with high income confiscation in the form of high income tax rates. High income tax rates result in either situation: (a) businesses do not go there, or (b) businesses try to pay lower income taxes by utilizing various loopholes, if not outright bribery of government tax bureaucrats. In many poorer economies, many tax bureaucrats actually directly solicit bribes in exchange for lower tax payment by corporations and individuals. Tax competition drives dynamic economies Hong Kong and Singapore to keep humming. The number of countries that have adopted the low, flat income tax policy is also rising. I'm writing from Braunschweig, Germany. First, by having the lowest corporate tax rate in Europe, they attracted business, but of course lots of these businesses left other European countries. So the other countries were never too happy about that. Often, businesses would do trickery like sending the money through Ireland to evade higher tax rates. Example: You bought a Dell Computer in Germany. Dell makes the computers in Munich, Germany, and you're a customer in Germany. The computer is sent to you and never leaves Germany. But your money goes to the Dell European headquarters in Ireland, and from there a part of the money pays for the making of the computer - so Ireland was used only for "money laundering" in this case. Second: The only mistake that the Irish government has made was covering all the debt of the banking sector - before they did this they had very low public debt - 30% or so; and after gobbling up the debt of their banking sector, their public debt exploded. Why was there so much failing banking debt? Because lots of cheap money flooded Ireland; banks from Europe lent Irish banks a lot of money, and the Irish banks lent it to housing project developers. When demand for housing dropped due to the economic crisis in 2008, a lot of these project developers defaulted; massive housing overcapacities could not be sold to customers. Thanks for the comments DirkH. One way to look at your example re Dell computer, customers buy the Dell computer because it's relatively cheaper, it's cheaper because the corp. income tax paid by Dell is only 12.5%, and not 35% or higher. So lower income tax results in cheaper price of computers and other goods and services, which expands consumer demand, which stimulates production and creates new jobs or retains existing jobs, in Germany or elsewhere.